What is the purpose of the concrete base 4 post plastic chain kit? 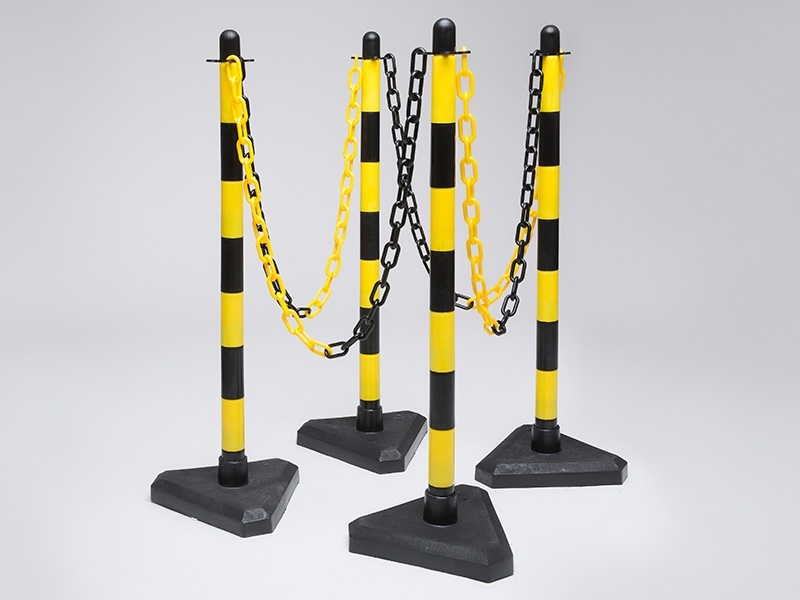 The concrete base 4 post plastic chain kit is a versatile utility chain assembly that can be used in multiple different disciplines and areas outside. Built with stability and visibility in mind, the heavy, sturdy concrete bases of the posts ensure that they won't be knocked over accidentally. 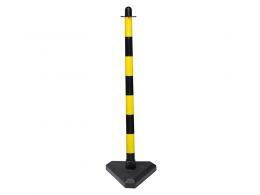 The black and yellow colour scheme makes sure the plastic posts remain highly visible even in the worst exterior weather conditions. The heavy bases of the posts lend themselves to being employed in exterior uses and they are very good at being used outside. The high-quality plastic construction coupled with the stable concrete bases make for a solid assembly that is well suited to whatever exterior purpose it may be called upon for. 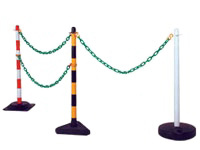 The highly coloured plastic chains add contrast and ensure that the posts aren't the only thing visible in all types of weather. 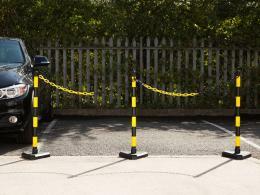 Companies can utilise these posts and chains as a means of protecting their parking areas after hours. They can also be used as a means of controlling the flow of traffic throughout a company’s parking lot or simply marking off parking spots in places where efficient use of parking is needed. The bases are sturdy enough to stand up to everyday exterior use and the chains can be easily replaced or expanded by buying more kits to extend the area that can be marked off. The concrete base 4 post plastic chain kit comes with 4 posts already assembled with their concrete bases inside the plastic covering. Alongside that are the yellow and black chains which come in at 2m apiece, for a grand total of 6m of high visibility chains. These chains have a thickness of 8mm, making them very durable to the elements. Additionally, because these posts and chains that make up this kit are interchangeable, it means that further kits may be bought in order to scale up the size of an area marked off by the chains and posts.